When Netflix picked up its popular, acclaimed, adult-targeted animated series “BoJack Horseman” for a third season last summer, creator Raphael Bob-Waksberg (The Exquisite Corpse Project) promised an even darker collection of episodes to come. All twelve episodes in the third season of the hit show released last weekend to more popularity and acclaim than the second while also keeping the creator’s foreshadowing true. Getting caught up in the Oscar campaign that began with taking the role of “Secretariat” in a biography last year, our favorite curmudgeonly horse with a conscience wades uncertain figurative waters populated with untrustworthy Hollywood agents and sycophants trying to attach themselves to a “re-rising” star. 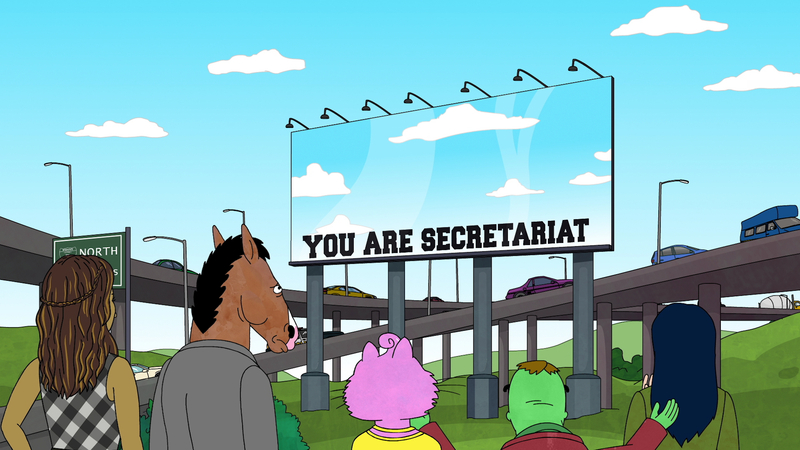 In the rat race of trying to win an Academy Award, BoJack forgets his true friends during his drive for Oscar glory and pays dearly with guilt and self-esteem. To balance BoJack’s harsh realism, this series thankfully continues to demonstrate what it does better than any comedy out in the pop culture spectrum today: complementing crushing plot points with absurd humor. The returning cast members also expand on their respective characters, which make for an exceptional season of “BoJack Horseman.” Amy Sedaris (“Unbreakable Kimmy Schmidt,” Strangers with Candy) brings a lighter mood to super-agent and house cat Princess Carolyn for the last couple of episodes after creating a glorious chaos to reflect the craziness of Hollywood award season at the beginning. “PC” will have to choose if getting wrapped in BoJack’s messes is worth her bother anymore or if seeking a more stable companion would make her happier. Alison Brie returns to voice a whole new Diane Nguyen. No longer a biographer, Diane makes social media posts, updates, and responses for celebrities in her new job. She knows she can do more with her talent and realizes that others see in this her, as well, but her marriage troubles with Mr. Peanutbutter make it difficult for Diane to get her career and priorities back on the right track. Aaron Paul (“Breaking Bad,” “The Path”) takes a back seat in the latest season as Todd. Todd experienced success in the previous seasons of the series, yet never held on to it long enough to enjoy the feeling. This theme certainly continues in the latest season as Todd finds a reason that may finally prompt him to leave BoJack’s place for good: love. Stand-up comic Paul F. Tompkins (“Mr. Show with Bob and David,” “Bajillion Dollar Propertie$”) once again steals the show as the ever-upbeat Mr. Peanutbutter. As each character deals with a crippling personal issue, Mr. Peanutbutter manages to keep his ears perked and tail wagging until some shocking news during a family vacation puts our favorite animated dog into a depressing state of mind. The best scenes in “BoJack Horseman” continue to be the ones featuring Todd and Mr. Peanutbutter hatching or enacting their (at first) seemingly harebrained schemes. Many familiar guests lend their voices in bit roles, as well. Kristen Schall (“30 Rock,” “Bob’s Burgers”) stands out in her return to the voice of Sarah Lynn. The troubled pop princess who co-starred on “Horsin’ Around” as a child gets caught up with BoJack in another bender playing into the greater seasonal arc that will surely have repercussions in an already-renewed fourth season. For the third season in a row, comedian/ actor Patton Oswalt (Young Adult, “Agents of S.H.I.E.L.D.”) voices Pinky Penguin and Pig Doctor. Academy Award-winner J.K. Simmons (Whiplash, Justice League) also continues to provide the voice of seasoned Hollywood producer/ aging reptile Lenny Turtletaub. With so much featured negativity, depression, and pessimism, it’s hard to believe that “BoJack Horseman” finds humor in the entertainment world at large—but it does. 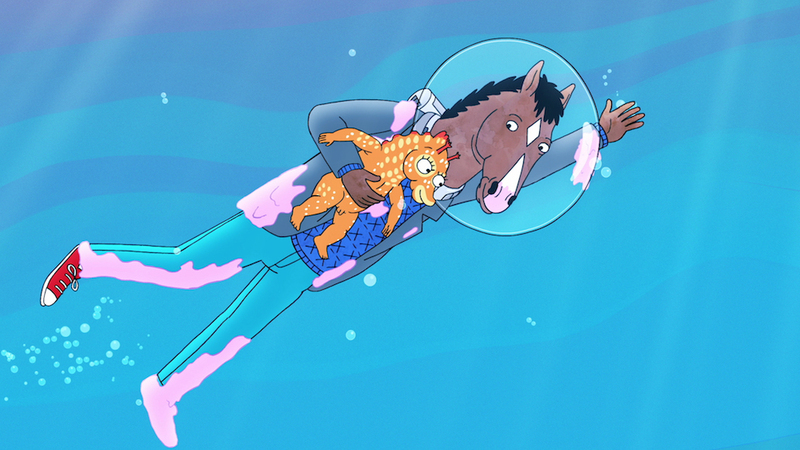 The latest season features a particularly dynamic episode entirely underwater without almost any spoken dialogue as BoJack tends to a newborn seahorse on the way to a sub-marine film festival showing Secretariat. 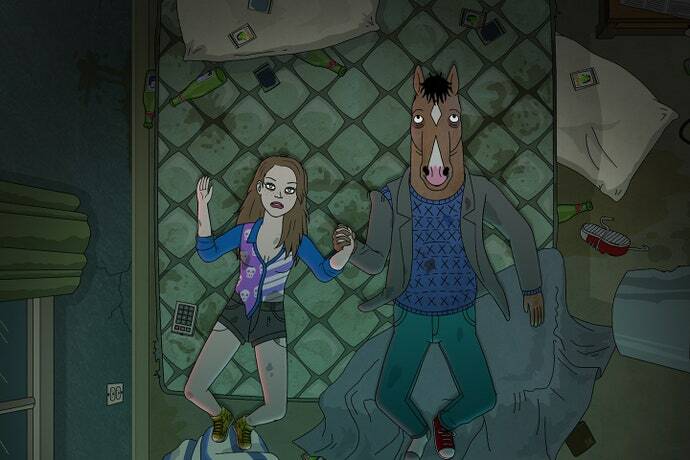 The series boasts new opening credits that reflect BoJack’s present arc with Grouplove also providing a few new tracks to the diverse soundtrack in addition to their closing credits song. The latest season of “BoJack Horseman” never shies away from the ugly tragedies and traumas of Hollywood, but never fails to balance such grim material with uproarious substance. Completely unafraid to break your heart, Netflix’s funniest comedy also dares to make you laugh in the following scene.